Business Wire: Ambarella announced the A7 IP Camera SoC capable to deliver 1080p60 H.264 video for surveillance market. The A7 integrates an image sensor pipeline with up to 500 MHz pixel capture rate (equivalent to 8MP at 60fps) with a multi-streaming 1080p60 H.264 encoder and power consumption below 1.5 Watts. The A7 supports 3D motion compensated noise reduction with no motion smearing and ghosting artifacts that are commonly associated with motion adaptive 3D filtering and digital WDR. Digitimes: Himax Imaging reportedly has landed image sensor for Dell notebooks, and has also cut into the supply chain of China handset brands including Huawei and ZTE, according to market rumors. Digitimes also writes that CMOS image sensors are currently in tight supply as foundries are unable to spare sufficient capacity at their 8-inch fabs, according to the newspaper's sources. Canon business report for 2010 says: "we produced steady results, including the development of CMOS sensors with an ultra-high pixel density capable of capturing details invisible to the naked eye. We showcased some of our achievements at “Canon EXPO” events held in New York, Paris, and Tokyo from September through November, where we also introduced our future vision with our imaging technology and products. Many who attended these events expressed praise and high expectations for that vision." The application talks about devoting one pixel in thousand to such a backside contact (one in each 32 x 32 block, or, may be, pseudo-random). The application says that "already established and applied methods of averaging out white or dead pixels in any CIS device will also remove the impact of the contact-dummy pixels from the final image. Therefore the final image will not significantly be altered by contact dummy pixels." Business Wire: Tessera has named Bob Roohparvar as its new president of Imaging & Optics. Roohparvar joins Tessera from Flextronics, which he joined in 2006 as president of FlexPower and president and CEO of Vista Point Technology. Prior to Flextronics, he served as vice president and general manager for Broadcom. He has also held management positions at Fairchild Semiconductor and Xicor. Roohparvar is an associate professor of Computer Engineering at California State University, East Bay. He holds B.S., M.S. and Ph.D. degrees in electrical engineering from Iowa State University, and is the inventor of multiple patents relating to semiconductor technology. CNET: I3A President Lisa Walker presented a new 5-star rating system for phone cameras at ISE 2011. The system is meant to give a more objective measure for cameras quality. "The test combines a host of technical measurements--detail, sharpness, chromatic aberration, lens distortion, and more--then links that analysis with subjective human assessments to ensure the measurements really are relevant. A detailed formula boils the various factors down into a single rating. The ratings likely will come with a matrix that shares a bit more detail about the camera performance for those who want more than a handful of stars. The matrix as presently designed shows a variety of shooting styles--action, landscape, portrait, macro--fare when photos are presented on small or large prints or shown on mobile phones or TVs:"
Stephane Laveau (DxO) "Colour shading : root causes and review of solutions"
Yang Ni (New Imaging Technologies) "MAGIC : Logarithmic Image Sensing using photodiode in solar cell mode"
Sandro Tedde (Siemens) "Organic and hybrid photodiodes for active matrix imaging"
Renato Turchetta (Rutherford Labs) "Large area CMOS image sensors for X-ray and charged particle detection"
Design News announced 2011 Golden Mousetrap Finalists. Aptina's APS-C 16MP MT9H004 is the only image sensor among them. The MT9H004 delivers 16MP images at 10fps, live-view video support and 1080p/30fps HD video recording. A 5dB increase in SNR is achievable under low-light conditions through the addition of a pixel-level, dual-conversion gain (DCG) switch. In high-light environments it can achieve a 47dB max SNR. The DCG switch controls the switching on and off of a capacitor connected to the FD node. PR Newswire: Pixelplus announced unaudited financial results for Q4 2010. The revenue for the quarter was 7.5 billion Korean won (US$6.6 million), compared to 7.0 billion Korean won (US$6.1 million) in Q3 2010, and 6.0 billion Korean won (US$5.3 million) in Q4 2009. Net income in Q4 2010 was 0.9 billion Korean won (US$0.8 million), compared to a net income of 1.6 billion Korean won (US$1.4 million) in Q3 2010, and a net income of 2.0 billion Korean won (US$1.8 million) in Q4 2009. Gross margin for Q4 2010 was 34.7%, compared to 40.5% in Q3 2010. The Company's lower-than-expected gross margin was mainly due to decrease in the average selling price of its image sensor sold in the fourth quarter. "We remain fully committed to achieving our long-term growth targets and business strategies through developing new products, penetrating new markets, and securing new design wins. ...the Company continues to vigorously pursue cost-control measures and effectively manage our operating expenses," said S.K. Lee, CEO and Founder of Pixelplus. Albert Theuwissen continues his series of reports from ISE 2011. The third part talks about Omnivision presentation on its BSI progress. While 1.4um pixel in BSI-1 had SNR10 of 88 Lux, BSI-2 improved it down to 58.5 Lux level. For 1.75um pixel SNR10 has been improved from 53Lux in BSI-1 to 41 Lux in BSI-2. 1.1um pixel SNR10 is 117 Lux. The future BSI-3 process is supposed to be based on 40nm design rules and will use new color filter technology. Philips presentation on Digital Photon Counting technology and applications is covered as well. Albert Theuwissen talks about his first day impressions at 2011 Image Sensors Europe converence at London, UK. Sony presented it 16MP 1.12um-pixel BSI sensor with a complex 2x4 pixel sharing scheme resulting in 1.375 transistors per pixel. Sony also proposes a new Moore law: image sensor speed improves by a factor of 2 every 3 years. Update: Albert's second post covers Tower presentation on BSI process offering, Aptina presentation on automotive sensors, CSEM on high speed imaging, Nocturnal Vision on its new technology and Grass Valley on imagers for broadcast cameras. Ikegami announced that its new GFCAM HD camcorder for HD cinema production is equipped with a 4/3-inch optical format Aptina 4K (4096×2160) CMOS sensor. The camera uses both horizontal and vertical oversampling to improve MTF and and provides 24p/25p/30p native recording. "Ikegami also addresses HD cinema production with the introduction of the new Four-Thirds GFCAM. Based on the workflow-efficient tapeless GFCAM HD Flash camcorder, the new camera is equipped with a 4/3-inch optical format Aptina 4K CMOS sensor for high resolution digital filmmaking. Providing excellent MTF both horizontally and vertically with over-sampling and 24p/25p/30p native recording, the camera uses lower-cost 64/128 GB Flash media that employs MLC (Multi Level Cell) technology with 10,000 times rewrite capacity. The new Four-Thirds GFCAM is designed to accept large format PL-Mount lenses for film-style high-aperture, shallow depth-of-focus cinematography." Thomson spin-off viimagic announced its new global shutter HDTV sensors 9221/2 and 9225/6. The 1080p sensors in 2/3” optical format are able to work at frame rates of up to 240 fps. With DDS (correlated Digital Double Sampling) processing, frame rates up to 120 fps are achievable. The DR of more than 120dB is stated, when operating in HDR mode. No other details clarifying the sensor's operation are given. EETimes: Toshiba hopes to restore some level of operation at its wafer fab in Kitakami, Iwate, by the end of March, the company said in a status update on Friday, March 18. However, the company said it will only be able to start test operations after recovery of its power supply. Iwate plant is one of the two Toshiba facilities producing image sensors. Iwate was one of the worst-affected by the devastating earthquake that hit Japan on March 11. The company said that ceilings, walls and air conditioning plant had been damaged at Iwate fab but that the company expected to complete repairs by the end of March. Also, some equipment had been moved from their fixed positions and Toshiba said it is working with equipment suppliers to get kit back in position and hooked up by the end of March. "Iwate Toshiba Electronics Co. Ltd., (location: Kitakami City, Iwate Pref.) will start to ramp-up production lines from March 28. To minimize impacts on customers, Toshiba has started to provide support at alternative production facilities, such as Oita Operations (Oita Pref. ), Himeji Operations-Semiconductor (Hyogo Pref.) and Kaga Toshiba Electronics Corporation (Ishikawa Pref.)" "So, for now, you can just count on incremental progress. The progress is still pretty rapid so even incremental progress over a few years looks like giant strides forward. 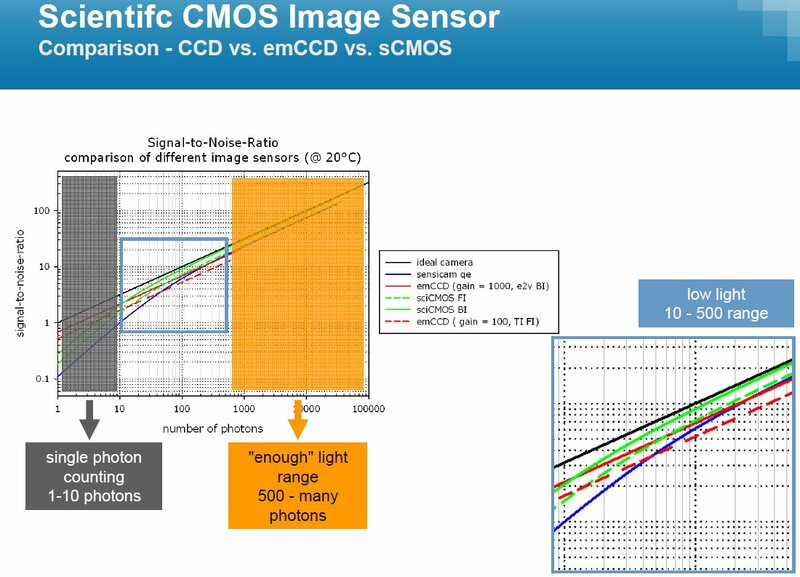 The CMOS APS is probably good for a 100Mpixels at the consumer level, maybe more, with the usual trade off between pixel SNR, DR, and resolution effects on IQ. WDR(HDR, XDR) and global shutter functions may appear in the next few years in DSLRs. Fast frame readout opens the door for lots of fun post processing. I do expect to see some 3D capability inserted down the road as there is already research going on for RGBZ kernels (one pixel used for range finding). This is challenging and product development will depend on consumer pull. I don't expect much pull from this community but for better or worse, this community has never had much impact on sensor technology development compared to consumers at large." Business Wire: So far TowerJazz’s CIS process has been running in its Israeli plants, and is now being added to the MPW program in its Newport Beach, CA facility for customers that require on-shore manufacturing. The CIS process enables the customization of pixels per project needs. In addition, TowerJazz’s stitching technology overcomes photolithography tool limitations to seamlessly tile 5.5-micron pixel sections into a large pixel color array. This technology enables manufacturing of die sizes up to a single die per 200-mm wafer. CIS process PDKs are scheduled for release in the first half of 2011 and the MPW is scheduled for availability in Q4. 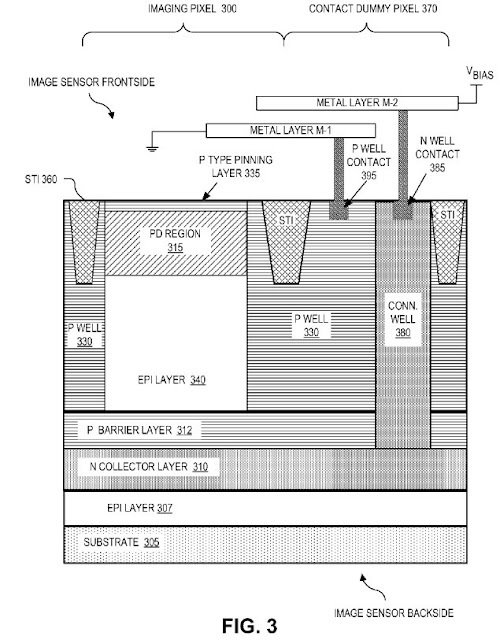 Patently Apple reports that Imperium (IP) Holdings, Inc. has filed a 5 image sensors patents infringement lawsuit against Apple, RIM, Sony Ericsson, Nokia, Motorola, Kyocera and LG. The listed assignees on the actual patents are Conexant and ESS Technology. Patent 6,271,884: Image Flicker Reduction with Fluorescent Lighting. 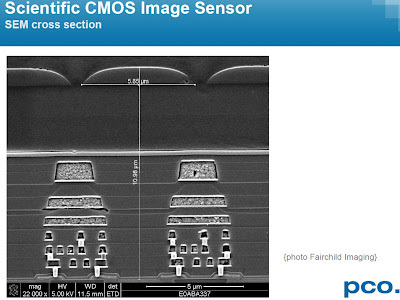 Patent 6,838,651: High Sensitivity Snap Shot CMOS Image Sensor. 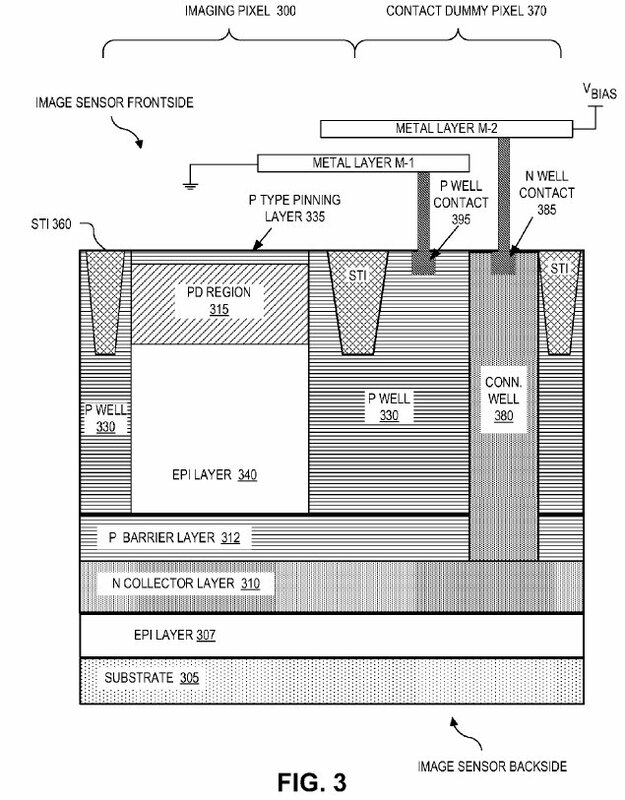 Patent 6,838,715: CMOS Image Sensor Arrangement with Reduced Pixel Light Shadowing. Patent 7,064,768: Bad Pixel Correction While Preserving Features. Patent 7,109,535: Semiconductor Device for Isolating a Photodiode to Reduce Junction Leakage. The case was filed in the US Texas Eastern District Court by Kaye Scholer LLP of Washington, D.C. March 18, 2011 under case number 6:2011cv00128. We are delaying registration payments until we understand the magnitude of the evolving nuclear catastrophe. As a precautionary step, we have started to investiagte alternate locations elsewhere in Japan and to consider neighboring countries in Asia. 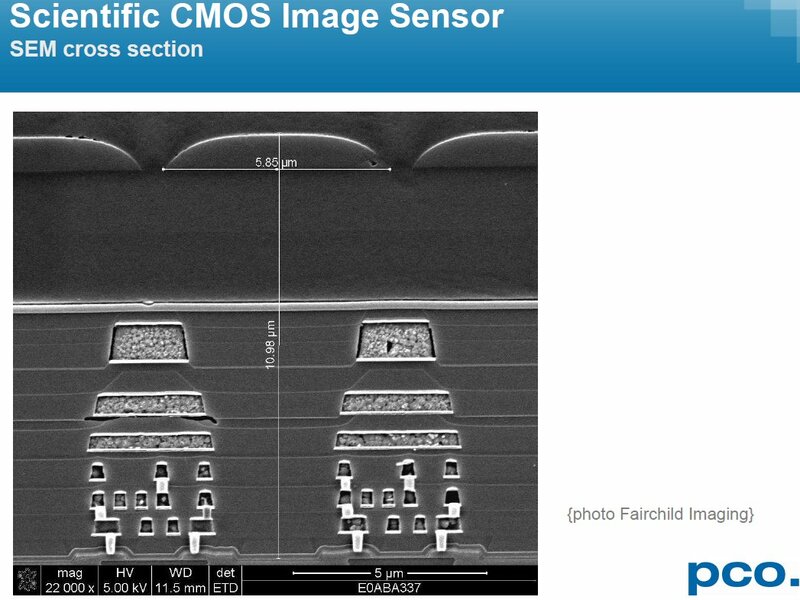 (from N. Teranishi and J. Nakamura)"
PCO, Germany-based camera maker and Fairchild Imaging's sCMOS sensor development partner, published a nice presentation on sCMOS imager titled "Modern CMOS Image Sensors for Scientific and Industrial Camera Applications" from Workshop on Scintillating Screen Applications in Beam Diagnostics held on Feb 14-15, 2011 in Darmstadt, Germany. Overall, it's a nice and easy to read marketing presentation with light technical content - recommended. Update: As mentioned in comments, there is a recent Photonics Spectra article comparing EMCCD with sCMOS "EMCCD vs. sCMOS for Microscopic Imaging" written by Photometrics, Arizona-based supplier of CCD cameras. It's interesting to see their comparisons to be somewhat similar to PCO's. Edoardo Charbon published a popular overview of SPAD imagers, the approaches to single-photon imaging and bibliography. 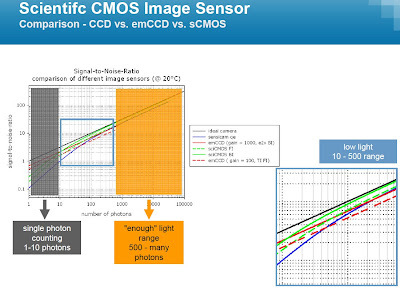 The overview is titled "CMOS integration enables massively parallel single-photon detection" and can be found on SPIE site. Business Wire: TowerJazz has kicked off development programs to further reduce dark current and enhance pixel dynamic range and angular response. Improved technology developed through these programs will be offered to TowerJazz customers during 2011. TowerJazz has also made significant progress with its BSI program which will be offered to customers for production in 2012. TowerJazz will be exhibiting at Image Sensors Europe 2011 (ISE) along with presenting its talk, "Foundry Perspective on Trends and Developments in CMOS Image Sensor Markets." TowerJazz passes along a 10% discount to attend the conference and workshops. Registering delegates should use the code TOWISE10 during the registration process at ISE site. Tessera announced that the System LSI Division of Samsung has licensed Tessera's OptiML Zoom image enhancement solution, which provides high quality 3X zoom capabilities, without moving parts. Tessera's OptiML Zoom combines unique lens designs with specialized algorithms and is said to be smaller, more cost-effective, easier to manufacture and more reliable than conventional mechanical zoom solutions. Business Wire: -TowerJazz announced that its advanced 0.18um CIS technology and PDK are now available for prototyping to companies, universities and research labs through Multi-Project wafer services provided by CMP. Technology News Room: Gordon Hopkinson (1952-2010) has passed away on Sept 24, 2010. At Leicester University (UK) Hopkinson developed ground breaking techniques for achieving low noise performance from CCDs and together with David Lumb wrote the definitive paper on the subject. These techniques were subsequently applied to the new breed of space imaging missions and are still used to this day. He has several publications in this field and numerous citations. Thanks to P.R. for sending me the link! Optics.org, CSEM, Globes, Xinhua: Aiming for clinical trials in 2013, an Israeli start-up Nano Retina neuron-stimulating synthetic retina is powered by spectacles featuring an infrared laser. 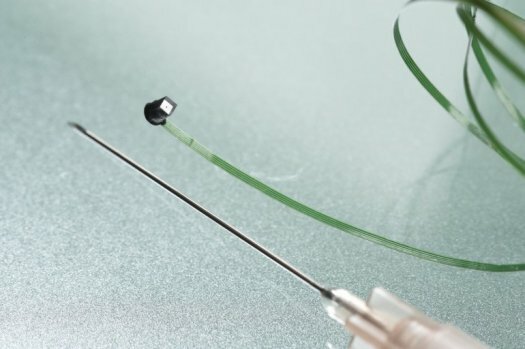 The bio-retina implant combines imager with neural interface which is glued to a patient’s macula – the area of the retina responsible for high-resolution central vision. The 3 x 4 mm and 1 mm thick implant captures light through the normal optical track of the eyeball and stimulate neurons to transmit information to the brain, partially restoring the function of the damaged photoreceptors. A similar technology is used by Germany-based Retina Implant AG. My sincere condolences to Japanese people who is suffering from the disastrous earthquake. Looking on the earthquake areas, Toshiba Iwate image sensor fab seems to be right in it. Panasonic Tonami image sensor plant seems to be quite close too (Most of other Panasonic fabs are near Osaka, far from the earthquake). I'm unable to see Canon CIS fab here (in Tokyo area, if I'm not mistaken). Also, Fujifilm CCD fab is not shown, not sure where it is located. Sony Kyushu fab is located in Fukuoka area, south of Japan. The new Sony Nagasaki center is also on the south. Sharp CCD fab is located in Fukuyama, near Hiroshima, also quite far on the south. Toshiba Oita CIS fab is on the south, so it should be OK. If somebody knows more about Japan image sensor plant locations and status, please add in comments. Update: Bloomberg reports that Toshiba shut down its Iwate plant and evacuated the employees. No damage was reported at the Iwate plant, which produces logic chips and CMOS image sensors for mobile-phone cameras, Keisuke Ohmori, a company spokesman, said by telephone. Update #2: Digitimes too reports that Toshiba closed its Iwate fab. Not much more info is given. EETimes gives guite a detaled summary of Japan fab status and damages. Intertech-Pira published an interview with Guy Meynants, VP R&D at CMOSIS and speaker at the upcoming ISE 2011 conference, talks about digital Sun-sensor on-a-chip for space navigation. Guy says: "A sun sensor is used as a part of the attitude and orbit control systems in a satellite or a spacecraft. It searches for the location of the sun in a section of the sky, extracts the centroid of the sun to sub-pixel resolution and then tracks the sun position. This information gives a partial solution to the attitude of the spacecraft. Common sun sensors rely on separate image sensors and an electronic processing unit to extract the sun information. That is rather bulky and complex. We have integrated all of this in a single sensor. This allows a much more compact system. In the presentation, the architecture of that chip is presented and its key performance data is given." Aptina congratulates Dr. Eric Fossum on his recent induction into the National Inventors Hall of Fame for his invention of CMOS-APS technology. His early work with CMOS continues to encourage innovation and drive the image sensor market. Dr. Fossum’s contributions to imaging science include work at JPL in the early 1990’s which were followed by contributions toward commercializing CMOS technology, and include founding Photobit Corporation in 1995 with others from JPL. In 2001, Photobit was acquired by Micron Technology and became Micron Imaging Group. This group became Aptina in 2008 and was spun off from Micron in 2009. "Working with Eric at NASA was very rewarding and resulted in advancing imaging technology and the development of CMOS imaging solutions into the mainstream," said Roger Panicacci, VP of product development at Aptina and one of four JPL engineers who helped create Photobit with Dr. Fossum. "The success of CMOS image sensors today wouldn’t be possible without his work on the active pixel sensor." The 6th edition of the International Conference on New Developments In Photodetection (NDIP11) is announced. The conference will be held on July 4-8, 2011, in Lyon, France. Its program will focus on the latest and most innovative developments in photodetection performed around the world in the fields of Nuclear Physics, High Energy Physics, Astrophysics and Cosmology as well as Biologogy, Medecine and Industrial Applications. The abstract submission deadline has been postponed to March 15, 2011. Thanks to AT for sending me the link! Albert Theuwissen continues his PTC series, now talking about conversion gain and PRNU extraction from PTC. Fraunhofer Institute for Reliability and Microintegration (IZM) in Berlin, Germany and Awaiba GmbH with support of the Fraunhofer Institute for Applied Optics and Precision Engineering IOF in Jena, Germany developed what they call the smallest camera in the world, only 1 cubic mm in volume, including its wafer-scale lens. The camera is intended for disposable endoscopy applications. It has a resolution of 62.500 pixels and transmits the image information through the endoscope via an electrical cable. Stephan Voltz, who is the CEO of Awaiba GmbH, says that "at 1,0 times 1,0 times 1.0 millimeters, this camera is as small as coarsely ground grain of salt – the smallest camera that we are aware of." About 28,000 such image sensors fit onto one wafer. BBC, Microsoft, Guinness World Records: Microsoft has sold more than 10 million Kinect sensor systems since launch on 4 November, and - according to Guinness World Records - is the fastest-selling consumer electronics device on record. Gaz Davies, editor of Guinness World Records 2011 Gamer's Edition, said: "We can confirm that no other consumer electronics device sold faster within a 60-day time span, an incredible achievement considering the strength of the sector." Guinness World Records said that Microsoft sold eight million devices between 4 November last year and 3 January at an average rate of 133,333 a day. The sales figures outstrip those of both Apple's iPhone and iPad when launched, Guinness said. ImageSensors.org is pleased to announce the online addition of historical CCD conference and tutorial material. This includes material from 1978, 1976 and 1975 CCD conferences as well as short course material from 1977. Original materials for scanning and library creation were provided courtesy of Prof. Marvin White. ImageSensors.org is seeking material from the 1973 and 1974 conferences, as well as a JPL workshop on scientific applications from the same period for on-line publication and archiving. Thanks to EF for sending me the link! Marketwire: In-Stat predicts MIPI CSI-2 penetration is to surpass 70% in computing and consumer electronic devices with image sensors by 2016. Smartphones and handsets will account for the largest percentage and highest growth rate of CSI-2 and CSI-3 penetration. In-Stat expects over 225 million Tablet PC image sensors to ship using MIPI in 2016, with MIPI CSI-3 representing about 20% of these, and MIPI CSI-2 representing 80%. "Proprietary interfaces prevent devices from different manufacturers from working together and result in industry fragmentation," says Jim McGregor, Chief Technology Strategist. "MIPI’s CSI-2 and CSI-3 provide the entire electronics industry, not just mobile devices, with a standard that is high-speed, low-power, cost-effective, and scalable." NIT announces a range of color sensors operating in logarithmic response mode. These new sensors are based upon NIT patented Native WDR pixel technology where the pixel photodiodes are used as single solar cells providing extraordinary intrinsic dynamic range without exposure time. The new sensors deliver sharp and accurate colour images over a dynamic range exceeding 140 dB, without any setup or need for white balance. Specific algorithms for colour de-bayerisation have been developed in order to accomodate the specific logarithmic response of NIT sensors. The photoelectric signal response of NIT photodiodes is predictable and modeled with extreme accuracy which simplify the chromatic calibration process and further increase the colour stability over temperature changes. Thanks to P.P. for sending me the info! Marketwire: TYZX announced that it has received a Notice of Allowance from the USPTO for TYZX's claims for the use of projecting a random textured pattern from a diffractive optimal element onto a target area in order for a stereo vision system to calculate distances to one or more points. This invention is called "Enhancing Stereo Depth Measurements with Projected Texture." "For many applications, including gaming, 3D mapping, and robotics, projecting a textured pattern on poorly illuminated or featureless surfaces makes calculating range data more effective," said Ron Buck, President and CEO of TYZX. "By integrating a texture projector in a TYZX stereo vision system, we create a highly accurate, highly compact, real-time 3D vision solution ideally suited for home entertainment systems that support a variety of applications such as gaming." Business Wire: TowerJazz announced it has signed contracts for two phases of development with the US Army RDECOM CERDEC Night Vision Electronics and Sensors Directorate (NVESD) for CMOS low light image sensor development for Army portable systems. As part of this effort, TowerJazz is expanding its aerospace and defense on-shore capability by introducing CIS foundry processes and solutions in its Newport Beach, CA facility. This project will result in advanced CIS technology at TowerJazz’s on-shore facility and provide the US Army with a solution for its demanding technology needs and provide state-of-the-art CIS technology for DoD CIS programs. A key goal of the US Army RDECOM CERDEC NVESD program is to enable CMOS imagers with low noise and high sensitivity over a broad spectral range. TowerJazz was chosen as a development partner due to its pixel process which uses advanced methods and technology providing higher pixel performance than competing commercial approaches. The transferred 180nm CMOS image sensor process at TowerJazz’s US location is meant to be a viable, commercially sustainable foundry offering to support not only the Army NVESD and their suppliers, but all DoD agencies and other interested third parties. The TowerJazz process will enable the design of the NVESD 4 Mpixel low light level BSI sensor and other low dark current, high performance imagers. TowerJazz will also evaluate the types of process flows needed to support fabrication of backside illuminated or SOI based CMOS image sensors. "BSI has become a new standard of CMOS sensor. BSI technology was developed by Sony and further promoted by Omnivision through TSMC. Manufacturers like Samsung, SETI and APTINA are following suit. During the technology migration period, the capacity might fall short of the demand, especially in the case of the CMOS sensor for notebook, which makes meager profit and the manufacturers are reluctant to produce. 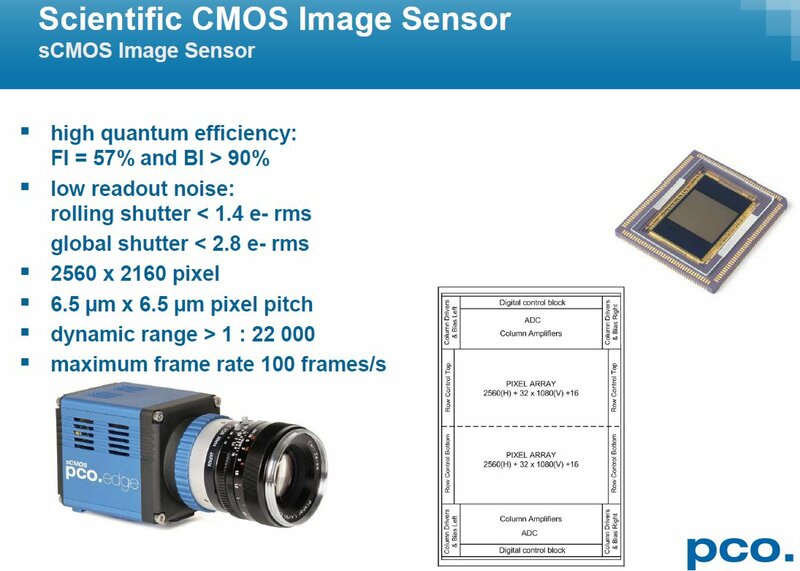 It is expected that the supply of CMOS sensor will be pinched throughout 2011. In the field of CMOS camera lens, Taiwanese enterprises are becoming stronger despite intensifying competition, while their Japanese counterparts lag behind. Largan Precision has consolidated its dominant position in the industry, way ahead the runner-up, Asia Optical, in revenue. Thanks to Ether Optronics, the mainland-based subsidiary, Asia Optical is getting increased in shipment. Japanese enterprises are engaged in the cut-throat competition with their Taiwanese peers while facing the pressure of JPY appreciation. 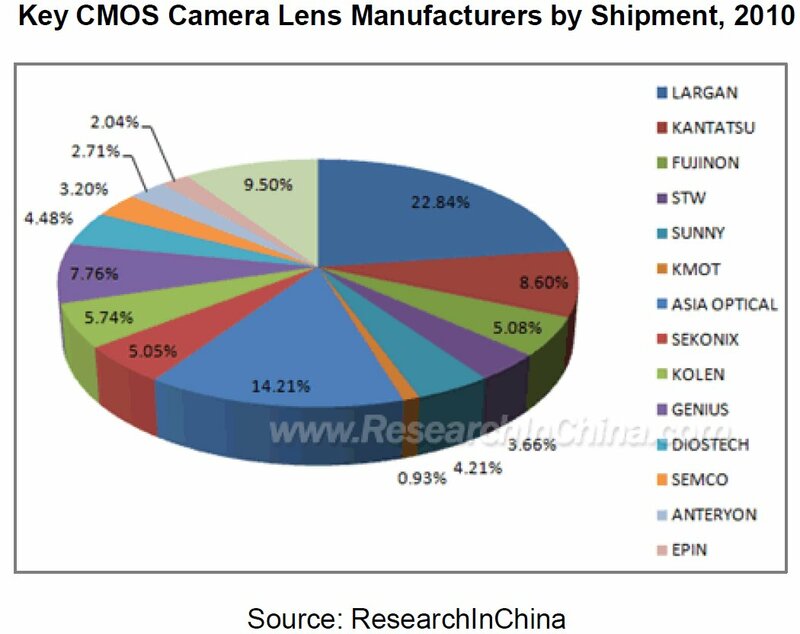 Most Japanese enterprises are USD10 billion-level giants, and they won’t provide too much support for CMOS camera lens accounting for less than 1% of their revenue. Take KMOT for example, its revenue from CMOS camera lens business in 2010 shrunk to one third of 2009. The same went for Fujinon, and other Japanese enterprises might quit the field. On the CMOS camera lens market in 2010, Genius Electronic Optical did a great job. In 2005, Genius Electronic Optical was acclaimed because of the glory of Motorola V3 series. In 2006-2009, Genius Electronic Optical suffered hard blows during the consecutive 4 years. But in the second half of 2009, Genius Electronic Optical passed the supplier authentication of Apple, becoming Apple’s second largest supplier of CMOS camera lens. In 2010, the revenue of Genius Electronic Optical rose by nearly 250%. And it is expected that the revenue of the enterprise in 2011 will increase by more than 5 folds over 2009, with the gross margin climbing up to 22% from -3%. In the field of CMOS camera module assembly in 2010, Foxconn continued to be the leader in this industry. Both Samsung Electro-Mechanics and LG INNOTEK increased their shipment, shoving Sharp from the first place to the third place. With the contracted shipment of Nokia, the shipment of Sharp will decrease further." 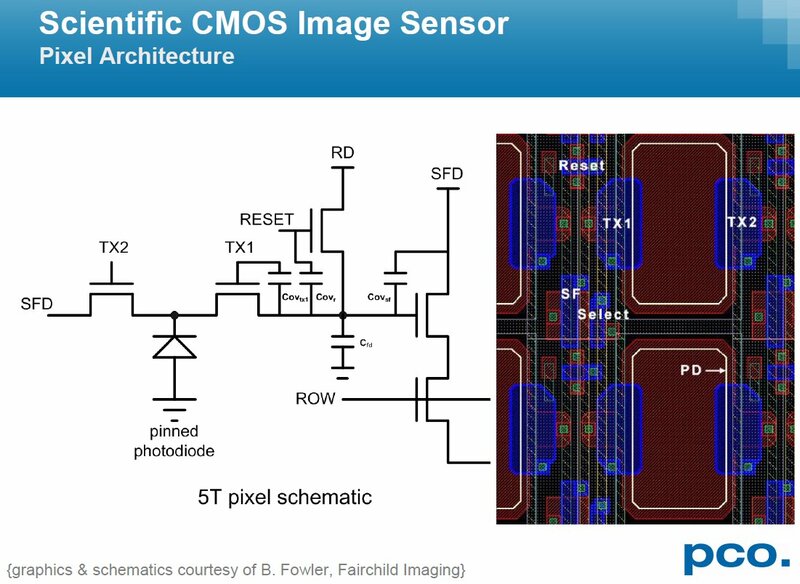 "CMOS Active Pixel Image Sensor - Eric Fossum, now at Dartmouth College, led the team at NASA's Jet Propulsion Laboratory that created the CMOS active pixel sensor camera-on-a-chip. Today, CMOS image sensors are a fixture in camera phones, and other applications include digital SLR cameras, embedded web-cams, automotive safety systems, swallowable pill cameras, toys and video games, and wireless video-security networks. Worldwide annual revenue for the technology is estimated to reach $6 billion in 2011." "Digital Camera - In 1975, Kodak engineer Steve Sasson created a device that captured an image, converted it to an electronic signal, digitized the signal, and stored the image—the first digital camera. In 2008, 73% of Americans owned a digital camera and 34 million digital cameras were sold in the U.S., generating $7 billion in revenue. Virtually all of today's digital cameras rely on the same structure invented in 1975." "First Optically Scanned Bar Code – Joe Woodland and Bernard Silver (deceased) invented the first optically scanned barcode, prompted in their work in 1948 after Silver overheard a food chain executive discussing his wish to capture product information at checkout. Today, the barcode has many applications, including tracking shipped packages, patient identification in hospitals, gift registries, and floor control in warehouses. It is estimated that five billion scans take place daily worldwide." The induction ceremony will take place on May 4 at the historic Patent Office Building, now the Smithsonian American Art Museum and the National Portrait Gallery, in Washington, D.C.
"Needham & Co analyst Rajvindra Gill expects BSI sensors to be the predominant image sensors for smartphones within 2 years or so. By 2014, 9 out of 10 smartphones and feature handsets will have BSI image sensors, up from fewer than one fifth today, predicts IHS iSuppli's Pamela Tufegdzic. 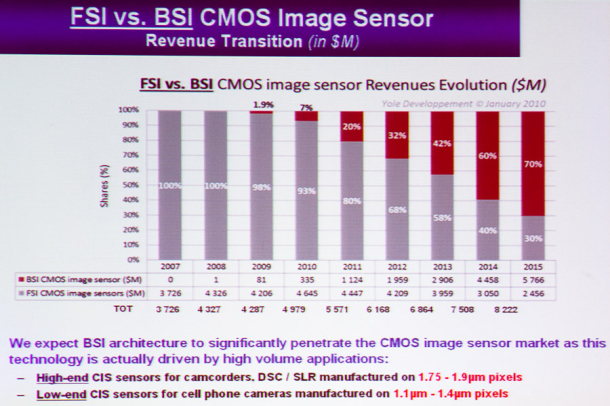 Analysts reckon the CMOS image sensor market is worth around $3 billion, and BSI sensors make up about 5 percent of that now." "OmniVision, which said in November it was already pursuing design wins for its second-generation BSI chip, is about 6-9 months ahead of its nearest competitors." iSuppli: CMOS image sensor shipments for DSCs in 2013 will reach 71.1 million units, up from 30.7 million in 2010. Meanwhile, CCD shipments will decline to 66.9 in 2013, down from 94.1 million in 2010. By 2014, more than 85 million DSC CMOS units will be shipping, compared to 51 million for CCD.